Death of an opponent practically ends the competition between enemies or rivals by the victory of the assassinators or by those who sent him. The ability to attack a political person means that the political way his supports come to its end. The death of the political leader means change and victory to his enemies. The cheapest and most affective protection is to take the VIP out of reach but as it is not realistic we need to compromise. As in many cases VIP wants maximum exposure and the VIP protection need minimum exposure. The purpose of this document is to present the training program of the security personal and the VIP bodyguard. In this document we cover also aspect of securing any kind of facility as pub and aspect of teaching method. In Principe the opposition group that wants to be in power or rule the country is politically motivated. From Mr. Gandhi (1869 – 1948) till Mr. Rafik Haariri (1956-2007) we have series of assassination which will be never stop probably. In every place we live. The common VIP security system is usually based on the idea of Protection Circles. What the Head of Security usually does is he places three "Protection Circles" around the VIP – Distant, Median and Close. The Distant Circle is usually the easiest to penetrate and its purpose is mostly for deterring. This circle usually consists of law enforcement personnel that scan the crowd, looking for known suspects. The Median Circle's purpose is to reject unauthorized persons from reaching the Close Circle. The outcome of utilizing the Median Circle is that it creates a "Sterile Zone" between itself and the Close Circle. The Close Circle is the last line of defense, and it is considered a system failure if a hostile person reaches the Close Circle. This Circle is constructed from the VIP's Bodyguards, whose job is to protect the VIP at any cost (as opposed to Political VIP protection, Private VIP protection usually consists of only this circle). While the Distant and Median Circles are used for deterrence and will repel the hostile person from the VIP, usually by use of technology (Security cameras, metal detectors etc) – the Close Circle is used to protect the VIP by first protecting him physically and then removing him from harm's way. This is done using the Human Factor and less by technological means. 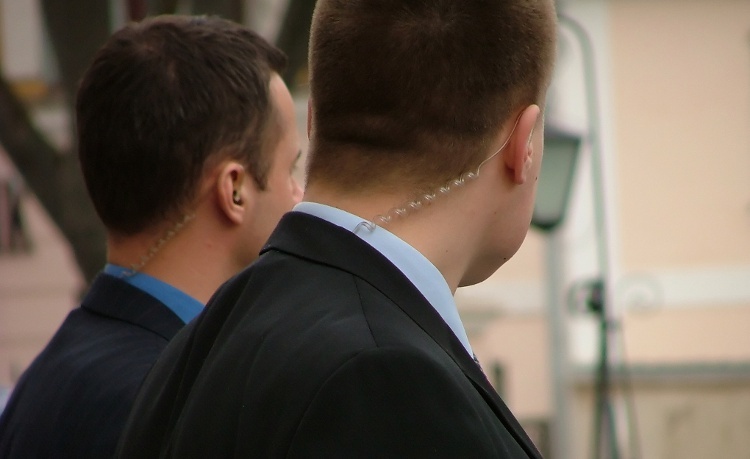 The main problem with VIP protection is that a Person becomes a Very Important Person because of his public exposure, and he would like to keep that exposure to the fullest. For VIP protection, this is a nightmare, because Maximum Exposure is a definite contradiction to Maximum Security. The easiest way to protect a VIP is to lock him up in a safe house, with no-one coming in – For a person who thrives on public exposure, this idea does not serve his needs. By allowing more people to come through the Distant and Median Circles and tightening the Close Circle, and relying on the Bodyguards to stop any intrusion. Because of the close range and the short reaction time allowed, the main tool of protection in this situation is Krav-Maga. Contact us for details & registration. Diploma for successful completion will be titled for this part . Physically, one must use the technique to protect someone else and not himself, by taking two physical actions; the first is removing the 3rd party from danger's way. The second is parrying the attacks for the 3rd party. Emotionally, one must make a switch in his mind; "switch off" his sense of self preservation, and "switch on" his sense of duty (natural, responsibility based or professional). Krav-Maga makes a person mentally ready for situations like these and gives him tools to react in the right way in the right state of mind in these times. An interesting example for a natural and instinctive 3rd party protection can be seen in this story: While pregnant with our first child, my wife went to a maternity course. When she climbed the stairs on her way there, she tripped down. Her first instinct was not to protect her head, or thwart away the steps as she fell towards them, but rather to protect her abdomen with her hands, and use her upper-body to cushion the fall. This example shows that 3rd Party protection is found in nature, but only in special circumstances and not in the normal course of things.